Blendtec 625 Review - Is the Designer 625 blender worth it ? Blendtec 625 Review – Is the Designer 625 blender worth it ? Blendtec is known for its powerful line of blenders especially its classic Total Blender that has been on the market since the 1990’s. A few years ago, Blendtec decided to improve on the Total Blender after extensive feedback from customers and they introduced the Designer blender series. The Blendtec Designer 625 is the entry model within its designer series. You probably have questions about the 625 like how well does it work ? Is it the best blender for your budget ? Can it handle different kinds of tasks? How does it compare to other Blendtec models ? We will answer all of those questions in this Blendtec Designer 625 review as we explain the strengths, weaknesses, and compare it to other top blenders. Let’s get started ! Designer 625 vs Blendtec Total Blender? Blendtec is known for making professional blenders as well as commercial ones, delivering plenty of blending power. The Designer 625 boasts a 1,560 watt, 3-HP motor which is the same motor as their extremely popular Total blender. Despite having the same motor as the classic Blendtec blender, the Designer series add a lot of key innovations. What you don’t see is the improved airflow design for improved motor cooling and greater motor control with a wider range of speeds. The most visible changes for the Designer 625 are the new sleek design and digital touchscreen controls. Blendtec is known as a market innovator for blender technology. They were the first brand to create programmed blending programs and touchscreen controls. Most of these features were originally created to work in commercial blending environments like smoothie shops so the Blendtec Designer 625 truly is a commercial blender designed for home use. The digital touch slider allows you to select from among 6 speed settings while it is blending. For hands-off blending you can choose from four pre-programmed cycles: Smoothie, Ice Cream, Whole Juice, and Hot Soup. When using a blending program, the blending time is shown on an illuminated LCD screen. The Designer 625 comes with Blendtec’s proven Blendtec Wildside+ Jar and patented blade design which can easily puree anything you put in it. The Wildside+ Jar features vents on the lid to allow steam to escape when you are preparing hot soups. It is also safe to put in the dishwasher. The Designer 625’s measures 15.5 inches in height so it can easily fit under cabinets and the sleek modern design with multiple color options looks great if you decide to leave it sitting out on your kitchen counter. With a 3 horsepower motor that spins at 300mph the Blendtec 625 is made to blend anything. It blends so fast it can create hot soups just from friction. The 625 has been on the market long enough to get feedback on reliability and performance. 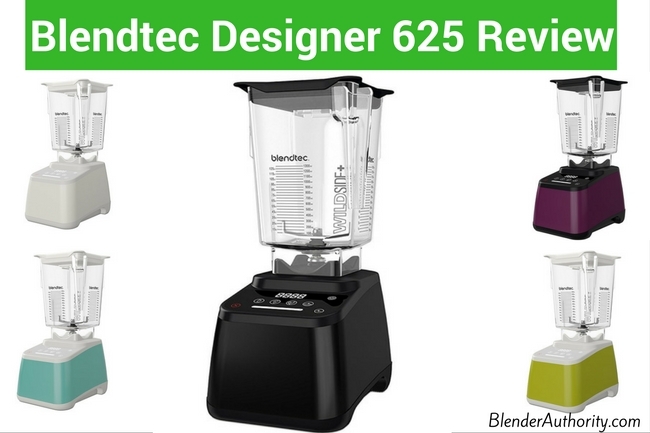 With the same motor as its popular Classic blender series, it is no surprise that the Designer 625 ranks very well at blending drinks and pureeing liquids. CNET rated the Blendtec Designer series very high because of its ability to blend anything and its strong performance across its various blending tests. The only negative they cited is that the Wildside Jar isn’t ideal for small batches. Consumer Reports rated the Designer 625 well but not as highly as their top pick the Vitamix 750. The Kitchn, a popular daily food magazine, did a series of experiments with this blender and found that it handled fruit and frozen fruit, vegetable, cashews and chickpeas extremely well. Nuts were easy work too, though it failed to make almond butter and instead, it ground the roasted almonds into dust. To make almond butter it required stopping regularly to scrape the paste off of the jar walls. The Wildside+ jar design is supposed to reduce the need for a tamper but it will struggle with thick recipes. You can get the Blendtec Twister Jar for an extra cost which works well with small recipes and can handle the thickest recipes such ice cream and nut butters. 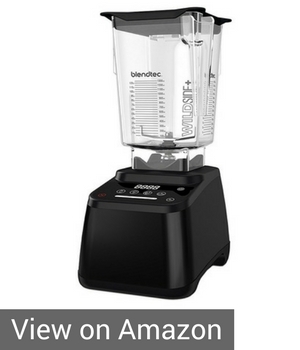 Overall, the Blendtec 625 is one of the strongest blenders for home use that you can buy. It rates very well in comparison tests for blending smoothies and various food prep tasks but the Wildside+ jar can be less efficient at blending some thick recipes wthout a tamper. Let’s get into the overall positives and negatives of the Blendtec 625 ! Positives: Very powerful yet simple to use. The six-stage speed slider and pulse makes this blender incredibly versatile. The 625 can puree ingredients effortlessly and it truly excels at making creamy smoothies. In addition to the pre-programmed features, this blender performs well at grinding ice. If you want fluffy, snowy crushed ice for your drinks in under thirty seconds, this is definitely a great blender for you. One of the major advantages of this blender is its user-friendliness. The jar markings are large and clear, the cycle buttons are clearly marked, and the flat control panel is a great for easy cleanup. Those who like attractive-looking appliances won’t be disappointed by the elegant design. The base comes in black, gray, white, red, blue, green, and a rich purple. Negatives: There are a few downsides. While the 625 blender performs well there are some minor issues with the jar design. The Wildside jar doesn’t have a spout for pouring and does not use a tamper. A tamper like the one you find on Vitamix blenders can be really helpful for thick recipes such as nut butters, dough, and ice cream. Without a tamper that means you have to stop the blender for thick recipes and push the ingredients around with a spatula. Blendtec’s Twister Jar, which you can buy separately, is designed to easily handle thick blends. The Wildside+ Jar might not blend small batches efficiently. Also, the power of this blender can cause it to move around a little on the counter when blending thick recipes so you have to keep an eye on it. Overall Opinion: The 625 is a very solid blender with nice features. It is priced similar to other competing blenders and generally performs well in blender comparison tests. It is very simple to use and easy to clean. The Designer 625 is a nice upgrade to the Classic series if you want sleek design, extra color choices, and adjustable slide speeds. It is perfect for someone who will be using the 625’s preset programs for smoothies, ice cream, juice and soups. Consumers generally chose the Designer 625 because of the power, clean design, easy to use controls, and reliability. If you want to see how the 625 compares to other Blendtec and Vitamix blenders then take a look at the comparisons below. The Blendtec Designer line was created to be more user-friendly, based on research done on the Blendtec Total blender line. Both series perform very well when it comes to blending. The Designer 625 is the first in the Designer series. Designer blenders are more intuitive to use, easier to store, and easier to clean. The Designer 625 has flat touchscreen controls which prevents any food from getting stuck in the buttons. Compared to the Classic 575, they have the same power but the Designer 625 has new design innovations as explained in the “Features” section earlier in this article. If you don’t care for the digital touchscreen controls then the cheaper blendtec 575 is worth considering. …but how does the Designer 625 perform compared to other Designer line products? The Designer 675 is less noisy than the Designer 625 blender. There are five pre-programmed cycles instead of four – including a Clean cycle as well. The price difference is based on the additional controls. In every other way, the Designer 675 performs the same and doesn’t have a tamper or a spout, either. You can wash both models by adding water (enough to cover the blades) and some soap, and then switching it on. According to Blendtec’s Q&A section, you can achieve the same effect as you get with the Clean cycle if you run your Designer 625 on Medium speed for 10-15 seconds. The Designer 725 is a more powerful blender that features a 3.8-HP motor with all the latest features from Blendtec including their “SmartBlend Technology”. Six cycles, and a hundred speed stages are available giving you a wide range. As a result, the 725 might be the best choice for users who want a lot of options and the best technology that Blendtec offers. You might want to go with the Designer 725 if you want more power and an absolutely customizable user interface to match your highly specific needs. The 725 is essentially a commercial blender designed for the home. The 725 is expensive so it might not be a good choice for users who tend to stick to a small number of recipes. We wrote about how Blendtec compares overall to Vitamix in our Blendtec 575 review. Some things to consider are that while both brands offer plenty of blending power, the Vitamix excels at a wide range of blending tasks while the Blendtec is truly excellent at blending drinks. The stylish Designer 625 will blend almost every kind of drink. If you want crush ice, make ice cream, smoothies, juices, or soups then this blender will meet your needs effortlessly. Cleaning this model is very easy and the jars are dishwasher friendly. Despite its 90-ounce volume capacity it is still small enough to store in most places or just to leave on your counter. The Blendtec 625 provides commercial blending strength with easy to use hands off controls. It offers a nice design and useful features that make it a solid choice. -> Click Here For Current Price on Designer 625 . Should you consider a refurbished model ? You can sometimes find the Blendtec 625 certified refurbished but the price difference from new isn’t much. 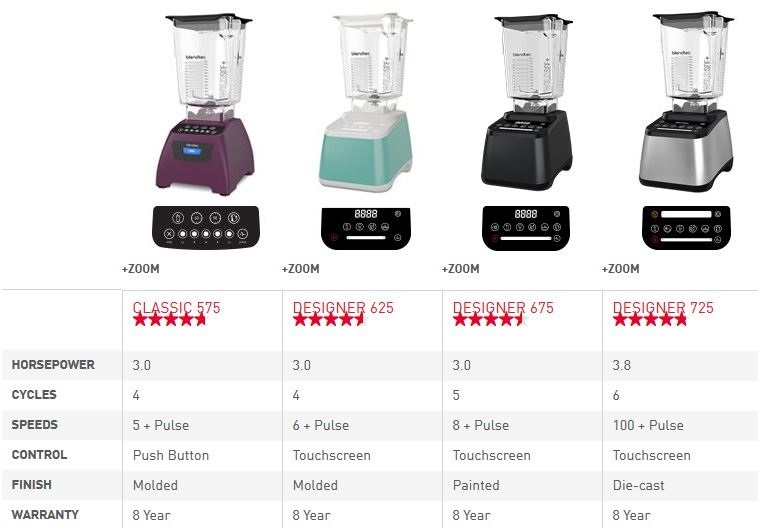 A new 625 is a better deal especially when you get a full 8 year warranty for a new blender versus only a 3 year warranty on a refurbished model.